This post contains affiliate links which means if you buy products through links in this post I may earn a commission. Read my full disclosure.This is a sponsored post. All opinions are my own. Read my full disclosure. With cool weather on the horizon, comfort food tops my menu plan each week. I especially crave hearty warm soup as the temperature outside begins to plummet. 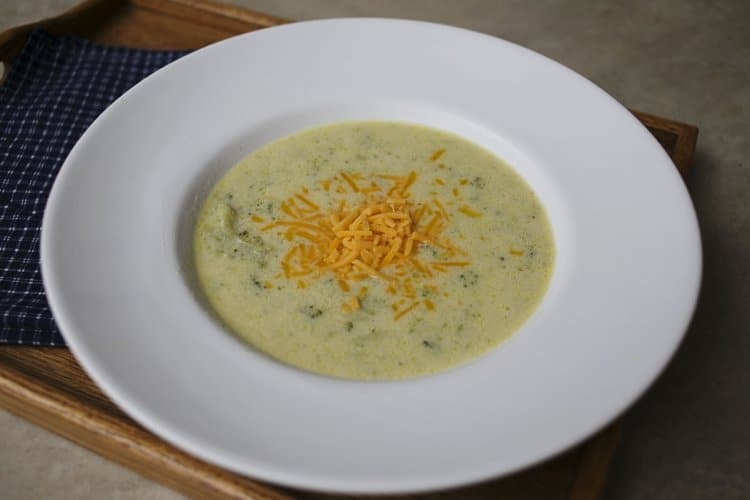 One of my favorite soups is Super Cheesy (and Easy) Broccoli Cheese Soup. It’s not only delicious, but quick and easy to cook. When it’s cold outside and life is busy, this soup is the perfect comfort food that won’t have keep Mom standing over the stove all afternoon. This season is so busy as we move into Thanksgiving and Christmas time. I love that I can spend my afternoons with my children- whether we are outside playing in the leaves or wrapping presents- rather than spending a huge amount of time getting our dinner ready with this delicious recipe. My mom often served this soup for lunch after church when I was a child, and that’s still my favorite time to eat it. This soup freezes well, so I love to cook a big pot and freeze it by the quart for an easy after-church lunch. Add a loaf of warm bread and fresh butter for a restaurant quality meal! My freezer is stocked with 4 quarts already, and I hope to add 4 more in the next week! Pour 8 cups of chicken broth in a large stock pot. Whisk in 6 tablespoons of flour and 2 teaspoons white pepper. Add one stick of butter, and turn stove on to medium heat. Stir in 2 bags of frozen broccoli florets. Bring to a simmer and cook for 20 to 30 minutes or until the broccoli is very tender. Add 2 cups of cheddar Kraft Natural Shredded Cheese, and stir until the cheese is melted and mixed in. Add 2 cups of half and half, stir until heated through. Fill a bowl, garnish with extra cheese and enjoy this yummy Super Cheesy (and Easy) Broccoli Soup on a cold day! Enjoy this yummy Super Cheesy (and Easy) Broccoli Soup on a cold day! It’s my favorite, and I bet it will quickly become yours too. Add a slice of crusty bread for a truly restaurant quality meal. 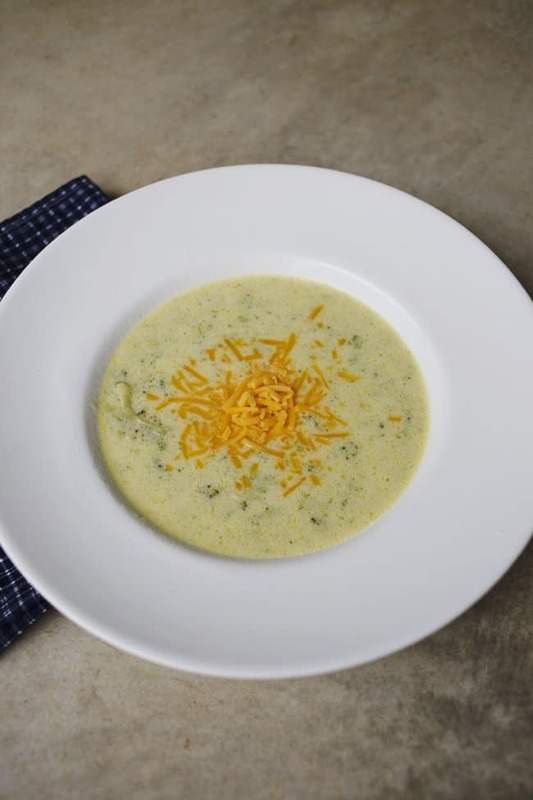 Make a big batch of this broccoli cheese soup and freeze the leftovers for a cold busy day. Trust me, you’ll be glad you did! Be sure to check out more of my delicious comfort food recipes here, and even more recipes with cheese here. I’d love to hear about your favorite cheesy recipe! I love broccoli and cheddar soup. This sounds amazing. OMG this is perfect with the cooler weather. I am craving soup all the time. Soups are my favorite thing to cook in the fall/winter. They are so great for freezing and enjoying leftovers too! This looks so good. I will make this and see if it gets eaten! I live on soup in the winter and I think I need to add this to my repertoire. It sounds delicious. This looks delicious! I need to pin this one for later! This looks amazing! And it looks easier to make than the broccoli cheddar soup recipe I've been using. I'll have to try yours! This does sound easy! I should really try this out so I have more easy meals to make myself for lunch this winter. What a great fall soup - I can see this with a bowl of crackers, too. This looks delicious. 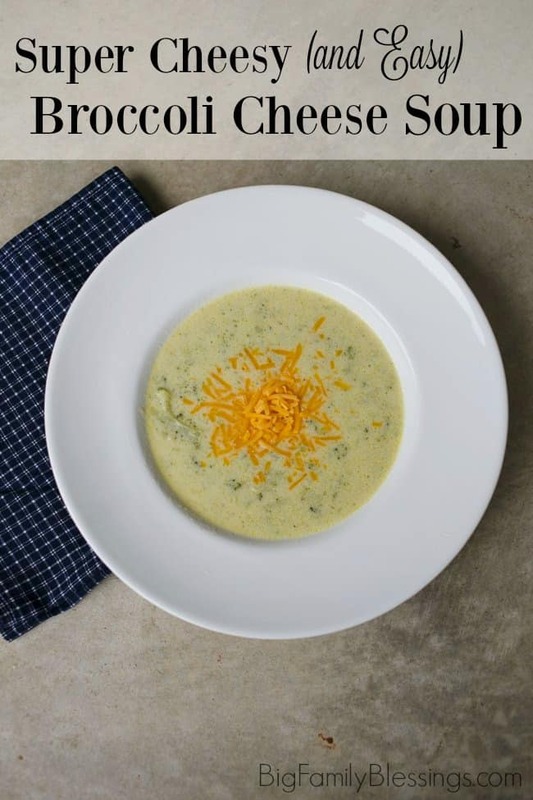 My husband loves broccoli cheese soup and I think he would totally dig this recipe! Thanks for sharing! This soup would make a great weekend dinner. Broccoli is one of my favorite vegetables. This is my fave. I've never made it at home though. Silly me. Pinning it. Mmmm, that looks like serious comfort food and perfect for a chilly fall evening! I love soup, but hate making it because it always seems so tough. This recipe is right up my alley! Looks scrumptious! LOVE the mix of cheese and broccoli. Get those veggies in for the kiddos!